Craving for some desserts? Take a visit at Lia’s where you can taste festive cakes for a reasonable value. Situated in 25 A & B East Capitol Drive, Brgy. Kapitolyo, Pasig City, this family-owned cake house has just celebrated its 10th Anniversary on December 08, 2014. Their signature product is the Avocado Cake – “Invented by Grandma in 1960s, perfected by Mom in 1990s, popularized by the Son in 2004”. In time for the perfect holiday season, we indulged ourselves with Lia’s three sumptuous cakes: Avocado Cake, Avocado Cheesecake ad Puto Bumbong Cake. Avocado Cake – From the color of it, you can instantly guess that this cake is made from avocado. You can even smell the sweet scent of the fruit from it. Topped with crushed pistachios followed by a chiffon then layered with a cake filling and another chiffon as the base, this cake is a must-try. Of course, this is their signature cake. Avocado Cheesecake – My personal favorite. If you were delighted by Avocado Cake why not try this Avocado Cheesecake. Topped also with crushed pistachios, it has a creamy and smooth taste of avocado. It’s super tasty to my palette and so I certainly love it!!! Puto Bumbong Cake – With a few more days before the Christmas Day, Puto Bumbong Cake is the perfect dessert for the Noche Buena feast. This is a made-to-order cake, so better take a call for reservation two days prior. It also comes in other variants such as Puto Bumbong Cupcakes and Puto Bumbong Bars. Puto Bumbong cake is still available until December 31, 2014, you can still buy next year but you have to make a pre-order by contacting them at least 3 days ahead or before pickup. For gift-giving this season, different flavors of cupcakes, cookies, bars and polvoron are also available. Your loved ones will definitely be delighted with your gift. At Lia’s you can also dine-in with your friends and families and enjoy their savory meals such as Baked Chicken Empanada, Homestyle Spaghetti, Aligue Pasta, Pork Asado Pasta, Baked Chicken Rice and Baked Fish Rice. 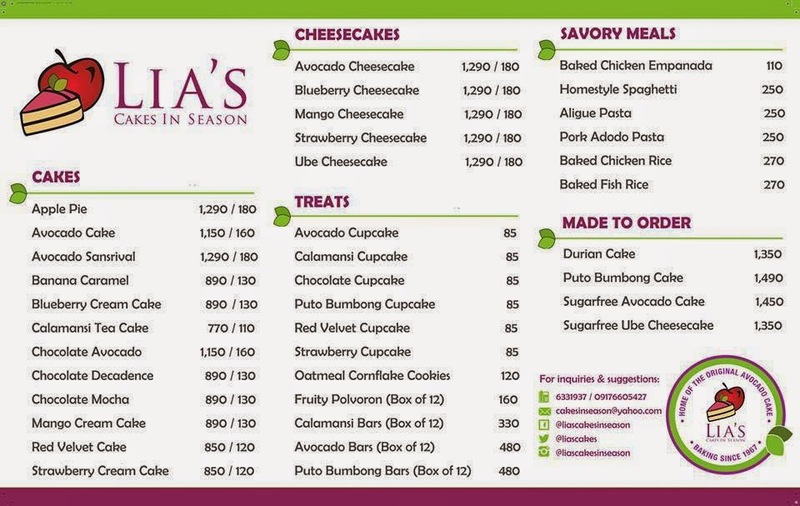 I’m also curious about other made-to-order cakes such as the Durian Cake (for those who love exotic taste and smell), Sugarfree Avocado Cake, and Sugarfree Ube Cheesecake (for those who are conscious about their sugar-intake). I will definitely have this a try in the near-future. When you visit Lia’s, you will see the post below in their wall from Carlo the proud son of Mommy Lia. Thanks to Sir Carlo and Ma'am Angel for the calendar and polvoron giveaway. Thanks to Ron for this review and Dianne for the photos. I wish Pasig was nearer or the Metro traffic not so bad in order for us non-Pasiguenos to enjoy this tempting treat. I hope they have a branch in QC as well in the future. They have branch at QC. once you visited manila, try to go to this place and try their famous desserts. Looks delicious! I haven't tried Avocado cheesecake. I am sure it taste delicious! Im definitely gonna try this soon! You must try and they have other cakes selection. favorite ko ang avocado! kamusta naman ang cake? and ganda ng place. sana next time magyaya nemen jen. Omg here its 2:30 in the night otherwise I would be going outside to find something sweet to eat ! Haha I loved the sweets ! Avocado and cheesecake all in one? omg I would love to try that! A cake from Avocado? Wow! Just wow! It looks brilliant. You were lucky to try it out pal! Avocado is one of my favorite fruits!!! It's the first time I've heard anyone selling avocado cake locally, so i'm definitely checking this out! hope you can try and please let me know if its good. The avocado cheesecake and cake looks really tasty. We should have more avocado flavored desserts. yes, you should try and let me know if its good. I have never been trying avocado till now. But since it is homemade, i am willing to try. Must be tasty. Avocado cake!!! Tasty and healthy. Sadly in my country hardly can find avocado cake. I've always wanted to try their avocado cakes! Is it good? And puto bumbong! Will they have it even after christmas? Puto Bumbong cake is still available until December 31, you can still buy next year but you have to contact them at least 2 days before pickup. Lia's desserts look so fascinating! The present boxes are also so stylish! I am a big desserts lover so I would definitely like to taste this famous avocado cake! The Avocado Cake caught my eye right away. I have never heard or had a cake made with avocados. Wow! It looks great. Yes, looks great and tasted good. @julianne caparos Puto Bumbong cake is still available until December 31, you can still buy next year but you have to contact them at least 2 days before pickup. I didn't know that are such sweet great avocado flavors out there. :) I would love to try to. Oh my sweet tooth! :D They looks so delicious. Happy Holidays!